Embrace this vacation with excitement like never before as this visit would enlighten and uplift your soul for anxiety and excitement. Sigiriya village is a great historic resemblance and a historic inspiration in terms of its major attraction: “The Sigiriya Rock Fortress”. The palace of Sigiriya lies in the district of Matale has been a true amusement for travelers across the world. The inhabitance around Sigiriya are from prehistoric times and the evidence of the rock shelters and caves that were occupied by Buddhist monks still clearly exist. 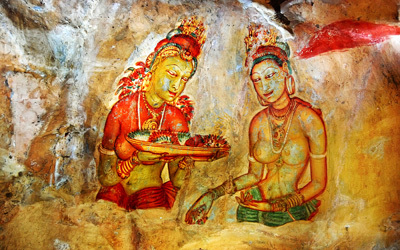 Sigiriya which serves all tourists as a major attraction has its own tale to narrate. The unparalleled tale of Sigiriya is a blend of imagination, vision, aristocracy and tragedy. One stepping in to Sigiriya has nothing but bits of evidences and remains that supported the tale of Sigiriya and its King. The story is about a king called King Kasyapa, born and bred in the capital city of Anuradhapura. In tolerant with many disputes and disagreements with his father the King almighty, king Kasyapa finally murdered his own father by plastering him up in a wall of the palace. With villagers who worshipped the late king made king Kasyapa’s life nothing but a hell of guilt. The guilt drove him far away from his palace in Anuradhapura where he fled his father’s kingdom and lived in an abandoned black forest for years until he discovered this amazing rock fortress with great height. He transformed this rock in to a great palace with many pavilions surrounded by lush green gardens and many more. The imaginary palace was nothing but magnificent and aristocratic. King Kasyapa shut himself in darkness and spent time alone in his chamber most of the time of depression. The king however in his late years had a troublesome life fearing of his sinful act of murder and betrayed by the trusted committed suicide. As you walk in to the complex, one would witness the most dramatic palace complex on the island. Awarded as one of the 7 world heritage sites, the site lets you observe the very detail of its beauty. The granite rock which is 200 meters tall has steep sides that makes parts of the base overhang its top. The top of this rock holds possession of the stairways and pools. The stones stairway from the base to the top would make one shiver. The mystique Sigiriya is nothing but marvel. The palace in the sky was nominated as the eighth world wonder by Sir. Arthur C. Clark. Let this tour to Sigiriya make your vacation filled with wonder and genuine interest. Fill yourself with ancient glory and magnificence unparalleled to any other and enjoy a tour that leaves you with momentous captures throughout your life.